I hope everyone had a pleasant holiday. I spent my baking 22 different type of cookies and knitting presents. I did get everything finished, not necessarily before Christmas. I will not be posting blog entries regularly during January and February. I will be at TNNA in San Diego from January 8-12 looking at new products to review for upcoming issues of Cast On. Then I will be having surgery on January 22nd. I am making no promises. I expect to be out and about fairly soon but you never know. I got several course orders during December and reviewed quite a few lessons. I've listed them to the right. If you send lessons in January, I will try to get to them as soon as I get back from San Diego. I hope to be able to review lessons by the end of January after my surgery. The next few tips will be about stripes. I love stripes. I will discuss single row stripes on circular needles, helix stripes and jogless joins in the upcoming weeks. Today's tip is about bi-colored purl stitches in striped ribbing. This is something that is included in Level 1 of the Masters Program. If you have ever knit stripes in ribbing, you probably have noticed that the row with the color change looks a little different (and not in a good way). If you look at the row where the white changes to red, you will see that red and white interlock in the purl stitches. The "frowns" (or the stitch itself) are white while the "smiles" (or the space between the stitches) are red. While knit stitches stack on top of each other in a column, purl stitches interlock the new stitch with the old stitch. 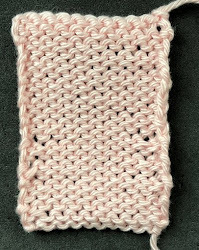 In the photograph, I have stretched the swatch so that you can clearly see the purl stitches. This may be an effect that you want in your project but most knitters prefer the clean look of the next color change where the red changes to white. Notice that there are no bi-colored purls. Salon will be on Sunday from 2-5pm. I hope you can make it. As usual, I forgot to take photos of some of the things I knit for gifts. I realized I didn't get a photo of the socks I made for my oldest daughter or the scarf I made for the younger one. I was in such a hurry to send them off! I made Jordan a pair of fingerless mitts using the same yarn I used for my daughter's socks. It is Alisha Goes Around, Tracks of Bison. I love this yarn. The colors are wonderful and it is a joy to work with. The photo doesn't do the color justice. It is a deep green in real life. Look at her website. The color is Downhill. Here is the scarf I made for Cynthia. It is a Classic Elite linen blend. She lives in Dallas so she doesn't need wool or alpaca! I have started working on my Cast On projects. I am doing the jacket to match the pencil skirt I did for the last issue. I haven't photographed it yet. By the time I do another posting I should have it done.